Also called fly screens or insect screens, window screens are a metal wire, fiberglass, or other synthetic fiber mesh stretched into a frame. Screens are designed to cover the opening of a window or door. The main purpose of a screen is to keep insects, leaves, and animals from entering a house or other structure, such as a porch, while allowing fresh outdoor air to circulate. In cold climates, screens are usually removed and replaced with storm windows which add a little more protection from the cold weather. Aluminum - One of the most common types of fabric used in screens is aluminum fabric. Aluminum fabric is available in natural aluminum and charcoal color. The charcoal is less visible and is a good choice if the view through the screen is an important part of your decision. Fiberglass - Another of the most common types of fabric is fiberglass screen fabric. This fabric is more opaque than aluminum, which reduces the amount of outdoor light that comes in. Fiberglass will not dent like the aluminum screen and is less expensive. Bronze - When initially installed, bronze fabric has a distinctive gold color that weathers to a charcoal color within a year. Bronze is a little less likely to be dented than aluminum. The high cost of bronze screening is the reason why it is not more commonly used. Solar Screen - This screen fabric reduces the amount of the sun's heat and UV rays that enter your home through the screen. Solar screen also reduces utility bills, increases the energy efficiency of your home, and keeps your carpet and other possessions from sun fading. Pet Screen - This type of screen was developed to be seven times stronger than traditional mesh screens. 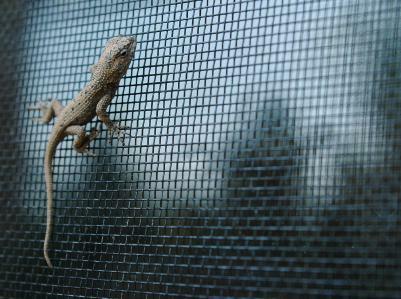 Fairly new on the market, pet screen is designed for patio and sliding glass doors. Roll Up Screens - Many manufacturers have a screen that rolls up into a pocket. Sizes range from a regular sized window to large enough to screen in your garage door. Roll up screens are useful if you want to enclose an area that is usually open. Wooden Frame - When replacing window screens on wooden frames, the screen mesh is stapled directly onto the frame. You should stretch the mesh tightly before beginning to nail the molding but not so tight as to deform the mesh. Small wooden trim molding is then nailed onto the wooden frame to cover up the ragged edges of the screen mesh. Aluminum Frame - Replacing screen in an aluminum frame is different than a wooden frame. To start, lay the screen mesh over the top of the frame; a rubber cord called a spline will then be pressed into a groove called a spline channel. A tool called a spline roller is used to push the spline to the bottom of the channel. If you don't have access to a spline roller, anything that is a little bit smaller than the spline will work. When the spline is fully installed into the channel, trim the screen. Due to corrosion concerns, only metal screens made of aluminum should be used in aluminum frames.